During my unit titled “Off to College”, we talk about a variety of topics related to college living and dorm life. One of these topics includes the “Freshmen 15”. Students always wonder if it’s true and if so, how does it happen. Since students were curious, I decided to let them figure out the answers by having them research the topic and create a game board that incorporated all of the information they learned in a fun, creative and competitive way. Students took turns playing each others games, providing feedback and learning something about the “Freshman 15”! I like to lead into this topic with this: College life has finally arrived! Woohoo! You have officially transitioned from high school to college and are now a freshman. This new position means making your own decisions about how to spend your time, when to go to bed, whether to do homework, study or even go to class. This goes for food decisions as well…no one to nag you about what to eat, when to eat or even how much to eat. Life is good! Until…you realize that as the semester advances, so does your waistline. Out of curiosity you jump on the scale, never dreaming that the numbers increased and you gained weight…YIKES! How did that happen? Now what? You’re experiencing what is commonly referred to as the “Freshman 15”. What’s that, you ask? You’re about to find out! Assign Part I of the Game Board Project and have students research what the “Freshman 15” is about. Students will follow the guide sheet criteria for the information they are responsible for finding. Briefly discuss or check their findings to make sure their on the right track. I like to show this clip to give an overview of Avoiding the Freshman 15. Assign Part II of the project which is creating the manila folder game board. See guide sheet below for the criteria. I do provide a workday to get them started. Note:This was an individual project for me due to my class size, but for larger classes, I would make this a group project. Once finished, students will play each other’s in class. 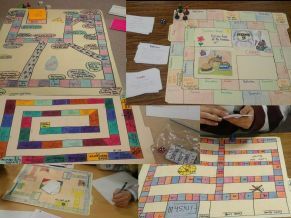 Students will peer-evaluate each other’s games for playability and for thoroughness of following the project criteria as explained in the rubric. Optional Extra Credit or Extension Assignment: Interview a college student regarding their views, opinions, and experiences with maintaining weight in college.